When asked to design and build the Reader Group exhibition stand for UK Construction Week 2017, we were absolutely delighted to be working with one of the leading blending and packing cement specialists within the construction industry. UK Construction Week, at the NEC Birmingham, is considered to be the UK’s largest construction event, uniting over 650 exhibitors and an audience of over 30,000 trade visitors. As it was Reader’s first time exhibiting, they obviously wanted to create good impression but felt that a standard shell scheme system would not provide them enough impact. It was agreed that a bespoke design, along with a little something ‘extra special’ to help attract plenty of visitor attraction, was exactly what they needed. 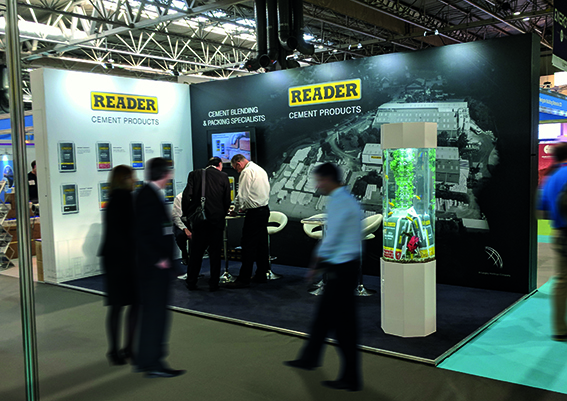 Whilst keeping costs as economic as possible and working to a rather tight deadline, CDA Creative designed a simple yet highly eye-catching exhibition backdrop to promote both the cement mixing and packing side of the business. The design included a huge aerial image of their impressive Pinxton production facility, stretching across the entire length of the back wall. To achieve an aerial shot large enough to work with, we used a drone to capture both 50MP DSLR still images and 4k video footage. Using a combination of the drone footage, still images and animated graphics, we also produced a promotional video for the Reader Cement production line and their impressive Pinxton facility. Packaging design thats the cat’s whiskers . . .